Bill Sarcione, 62, fabricated a gasketed panel at New England Die Cutting in Methuen. Company president Kimberly Abare is worried about employees who might soon retire. The biggest hurdle to the state’s economic growth isn’t a slowing Chinese economy, collapsing oil prices, or gyrating financial markets. It’s your graying co-worker. The long-predicted wave of baby boomer retirements — delayed by the recession of 2007-2009 — is beginning to hit companies in Massachusetts and across the nation, leaving employers scrambling to find replacements for their departing sixtysomething workers. The oldest of the generation that has dominated the workplace for decades turns 70 this year, and about a quarter of the nation’s 79 million boomers have passed the traditional retirement age of 65. Massachusetts, which has an older workforce than the nation, is already feeling the effects as industries from health care to manufacturing face worsening labor shortages. The state’s prime working-age population (24 to 55) is projected to shrink by more than 35,000 — about 1 percent to the total labor force — over the next three years and contract further throughout the next decade, according to the US Census. By 2018, employment growth in Massachusetts is expected to plunge by more than half — not because there aren’t jobs, but because there won’t be enough workers to fill them, according to the most recent forecast by the New England Economic Partnership, a nonprofit group of business and academic economists. That prospect is daunting for a state and region whose main competitive advantage is a skilled and educated workforce, analysts said. Sustaining that advantage presents a critical public policy challenge as Massachusetts competes with other states to attract and retain younger workers, including addressing the already high — and rising — cost of housing. Perhaps more sobering: The state’s economic growth rate is projected to fall by half, to about 1.5 percent, from 3 percent in 2015, as a result of the labor shortage. 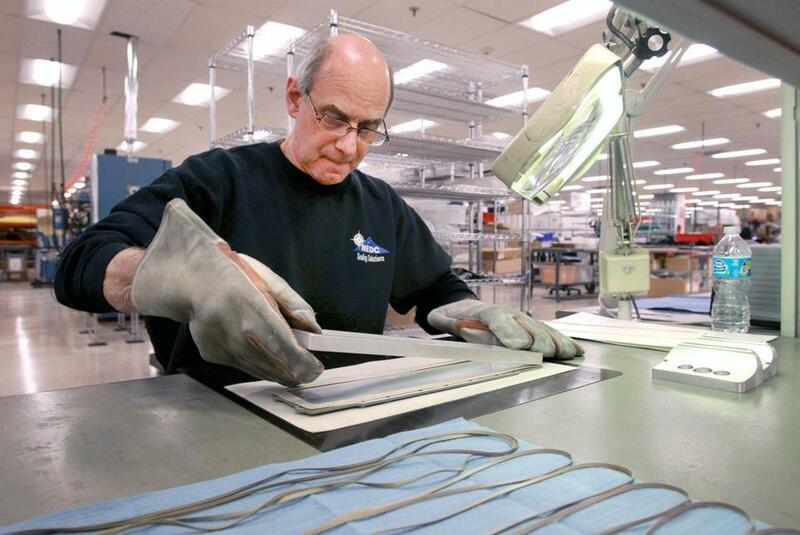 Kimberly Abare, president of New England Die Cutting Inc. in Methuen, realized she had a problem two months ago when a longtime employee who is 62 said he would retire this year. She looked at her 40-person workforce and realized that about one in six were 55 and older, many in crucial roles such as quality control, operations management, and research and development. It can take weeks to hire employees, months to train them, and years for them the gain the top-level skills to make precision seals and gaskets for military and aerospace industry customers, Abare said. She is now trying to determine the retirement intentions of her workers, along with the skill gaps the family-owned manufacturer could face. She’s also considering boosting part-time benefits to keep older employees working past retirement age. Larger companies are facing similar pressures. At Liberty Mutual, where one out of four workers is a boomer, the company expects to see the rate of retirement pick up over the next five years, from 1.2 percent annually to slightly under 2 percent of its 38,500-person US workforce. The impact could be particularly acute in underwriting and other areas that require years of know-how. Along with worker productivity, the labor force is one of two main drivers of economic growth. A dwindling labor force can mean flagging growth and all that it entails: fewer jobs, lower incomes, and less tax revenue to support government programs. Amid the dire predictions, there are some good signs: A strong tech-driven economy is bringing more people into the state, and the state’s population is growing, expanding at about twice the rate the US Census projected a few years ago. Residential developers, for example, are building more projects with smaller units to cater to younger workers. The number of Boston residents between 18 and 34 has risen 17 percent since 2000, according to the Boston Redevelopment Authority. But beyond Greater Boston, the age of the workforce in the rest of Massachusetts looks more like that of Vermont and Maine, which have some of the oldest workers in the country, according to the Federal Reserve Bank of Boston. Massachusetts has the 14th- oldest labor force in the nation, with 40 percent of its workers over 45, according to the Boston College Center on Aging & Work. Over the next six years, the state’s employers will need to fill 1.2 million jobs — about a third of all employment in the state — with the majority of openings due to retirements, according to a study by the Dukakis Center for Urban and Regional Policy at Northeastern University. The industries hardest hit by projected labor shortages will include manufacturing, health care, and financial services, according to the Northeastern study. Financial services, for example, will lose one in five workers by 2022 to retirement or departures from the state or from the profession. Health care will need to fill nearly 90,000 jobs, or one in seven, during this period, more than half to replace the existing workforce, the rest to fill new jobs as the sector grows. More than half of manufacturing workers are 45 and older, and some 30,000 — also about one in seven — will retire over the next six years. The issue has become so pressing that big manufacturers, worried about the timely delivery of components, are asking smaller manufacturers in their supply chain to provide plans for addressing labor and skill shortages, according to the Massachusetts Manufacturing Extension Partnership in Worcester, a nonprofit that supports manufacturers. “These large companies realize that the supply chain may be a weak link,” said Ted Bauer, the group’s director of workforce development strategies. At the defense contractor Raytheon Co., 45 percent of workers are 50 and older. The Waltham company is analyzing data to predict where retirements may occur and to ensure skills are transferred to younger employees, said Beth Carlson, vice president of talent development. “We are accelerating the readiness of our talent,” she said. Some human resources specialists worry that companies aren’t as prepared as they should be. “Most do not have a comprehensive plan to address baby boomer retirement,” said Tracy Burns, chief executive of the Northeast Human Resources Association, a trade group in Concord. The Massachusetts Nurses Association said US hospitals have known for years that their workforce is aging. Economists estimate that by 2020, about 80,000 registered nurses a year will retire nationwide, up from 30,000 a decade ago. In Massachusetts, the Northeastern study estimates that each year hospitals will need to fill 3,000 registered nurse jobs, the equivalent of nearly 3 percent of registered nurses in the state. The problem is more acute among specialty nurses, who work in emergency rooms, operating rooms, and intensive care units and tend to be older because they are more experienced. Several hospitals in Massachusetts are accelerating the training of younger nurses to work in various specialties. Others are offering senior nurses more-flexible shifts to encourage them to work longer. “It’s not about the head count, it’s about the knowledge drain,” said Patty Samra, director of clinical workforce planning at Baystate Medical Center in Springfield. The hospital used to have three nurses a year retiring from a specialty field; it now has about five, she said. Karen Higgins, 62, an intensive care nurse at Boston Medical Center, said she worries that time is running out and these measures may not be enough.